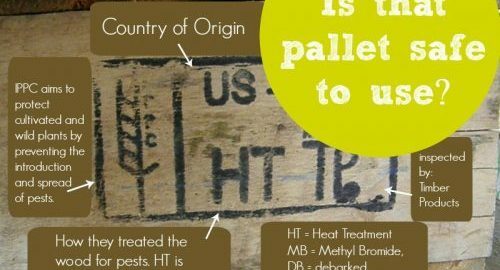 Every pallet has a label stamped on in somewhere. 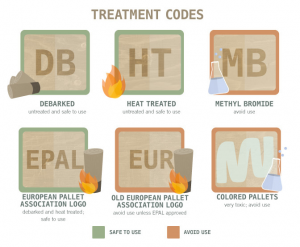 If your pallet does not have this label – don’t use it – you are putting yourself at risk. The label will have several codes on it that list the following. ONLY pallets marked HT – for heat treatment are safe to use. DB means that the wood was debarked. It has no bearing on the safety of the pallet. 1) IPPC Logo: If your pallet comes from abroad and does not have this seal of approval, you don’t know what it’s been used for or treated with. • Hammer, Pry Bar, and Cat’s Paw: A small cat’s paw or pry bar, a flat clawed hammer, and a block of wood are all you really need to break apart a pallet without damaging the surface of the wood. • Nail Punch: Using a nail punch to drive rather than pull the nails free can be the preferred method on stubborn ring, screw, or spiral-shanked nails. Pneumatic nail punches work even better, but can cost a pretty penny. • Oscillating Tool: By loosening up tight planks with a pry bar first, you can expose the nail shank to the cutting blade of an oscillating tool and make quick work of rusty nails. • Drill: When the above methods won’t work and you’re stuck with a nail that won’t budge, you can always use a metal drill bit and drill to remove ancient pallet nails. • Clean Cut: Last but not least (and if all else fails) you can quickly cut the pallet planks and leave the pallet ends and nails still attached to the stringer.